One of East Anglia's more remote churches, half a mile from the nearest road down a long track. A place of silence and stillness. On the face of it a 13th Century church, but there is more to this than meets the eye. For the second half of the 19th Century, Wormegay and Tottenhill churches were in the hands of one of the great Norfolk church eccentrics, the Reverend William Henry Henslowe. It would be no exaggeration to call Henslowe a controversial figure. The upset and acrimony he caused in his postings previous to Wormegay had caused him to be quietly moved on until, at the age of 38, he washed up here, where he would spend the rest of his life as perpetual curate. Some of his previous scrapes shine a positive light on his character. 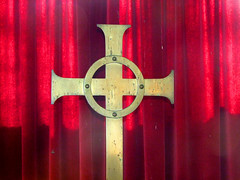 As acting chaplain to the Royal Artillery Regiment at Woolwich, he preached a series of sermons which were so increasingly critical of the brutality of military discipline in the barracks that eventually his superiors banned him and locked the doors of the chapel against him. The publication of the sermons in 1836 caused a national uproar and led to improvements in the Army's care of its ordinary soldiers. 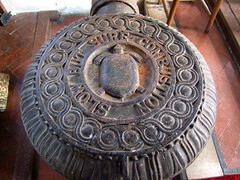 He applied for, and obtained the curacy of Southery in Norfolk, but fell into dispute with the new owner of the living, a wealthy brewer, who had purchased it for the benefit of his son. It appears that the brewer was eventually able to eject Henslowe by paying the owners of another nearby living to take him off his hands. And so in 1840 Henslowe came to Wormegay. It was a desperately poor place to be a Church of England minister, as were many in this part of Norfolk. The stipend for the parish was just £12 a year, and for neighbouring Tottenhill, which came as part of the Wormegay package, another £20. The total of £32 a year is about £6,500 in today's money, quite impossible to live on. The Wormegay stipend was raised to £40 for Henslowe, probably because there was no rectory and he had to find somewhere for his family to live, but even so the new total of £60 was only £12,000 by early 21st Century standards. 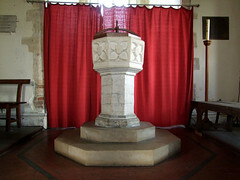 Henslowe's first major controversy at Wormegay occured in 1844, when his failure to baptise a dying child in time led to it being refused a burial in consecrated ground. Unfortunately for Henslowe, the child's parents were prominent Methodists and the event became a local scandal, not least because the child's parents, probably urged on by their Methodist minister, left the child's body on the church doorstep. 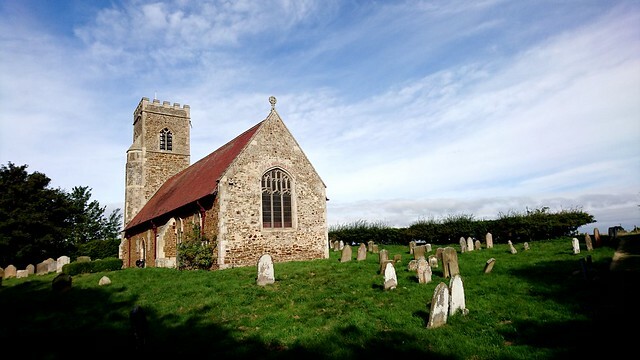 It was not until a similar controversy at Akenham in Suffolk some thirty years later that there was a change to the national burial laws, allowing ministers of all denominations to bury in parish churchyards. Henslowe was an early follower of the Oxford Movement, and an enthusiast for the introduction of High Church liturgy. This did not endear him to all of his parishioners, many of whom were non-conformists. 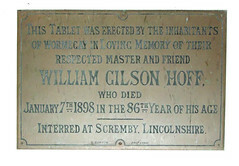 He was against the establishment of a National School in Wormegay because the board was made up principally of Methodists, who on one occasion marched their charges out of his service (National School children had to attend the parish church) and then let the school fall moribund so that only a few girls attended, the other children travelling elsewhere to schools in what were perceived as less High Church parishes. As was common with several prominent figures in the early Anglo-Catholic movement, there was a certain amount of fantasy injected into Henslowe's perception of history. On the strength of his name, he decided that he was a direct descendant of Hengist the warrior chieftain who had invaded East Anglia in AD 454. He began to invest his parishes with an increasingly bizarre mythology, changing his spelling of Wormegay to Wermigey, and in 1854 publishing a long prose poem about it called Wermigey, or the Weir Amid the Water: A Norfolk legend of the beginning of the Wars of the Roses. 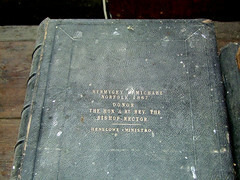 By 1867, when he presented to the church the Bible which is still in use today, he had changed the spelling further to Wyrmygey, and the cover of the Bible records its donor as The Hon. and Right Rev. the Bishop-Rector Henslowe-Ministro. This may seem odd, but it was simply that, in the Middle Ages, the rectories of Wormegay and Tottenhill had been the preserve of Wormegay Priory. Since the Prior had the status of a Bishop, in 1848 Henslowe had decided that he too was now a Bishop thanks to taking on the rectories as perpetual curate. 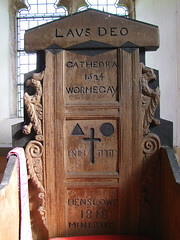 He converted the early 17th Century back of a pulpit into a Bishop's throne, marking it Cathedra Wormegay around the original date, and Henslowe Ministro around the date 1848 below. Henslowe was an enthusiastic and prolific writer. Whether this was to supplement the lowly income from his ministry, or simply because he wanted his strong opinions to be read, I don't know. Books of his that are, even today, available on Amazon as reprints, include a treatise on linguistics called The Phonarthron, or Natural System of the Sounds of Speech, A Test of Pronunciation for All Languages, as well as a polemical work of 1847 which appears to be a disgruntled attack on the position he found himself in at Wormegay, Facts and Tracts in Evidence of the Apathy, Dereliction, and Degradation of the National Clergy, by the Incumbent of Wormegay & Tottenhill, and my personal favourite, Beard-Shaving, and the Common Use of the Razor, an Unnatural, Irrational, Unmanly, Ungodly, and Fatal Fashion among Christians, in Verse. Henslowe didn't just write on paper. A mile or so off at Tottenhill is a huge memorial to his mother, who lived in Kent but died at his parsonage house in 1859. On it, he records that she was robbed by a trustee of her inheritance and went on to live a life of strange vicissitude. It boasts that as a child she had attended the death bed of the composer Thomas Arne, and eulogises her in treacly verses which Henslowe wrote himself. 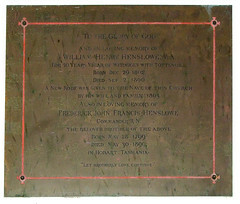 The memorial is worth seeing if only to get an idea of Henslowe's writing style. 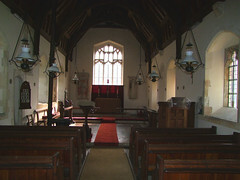 William Henry Henslowe died in 1890, and by the bequest of his will the church was almost entirely rebuilt, only the tower and the east wall of the chancel surviving. 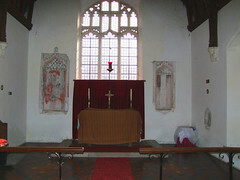 It is this wall which retains the church's most interesting feature, two elaborate image niches facing west either side of the east window. They are painted with canopies and curtains hanging from cords. 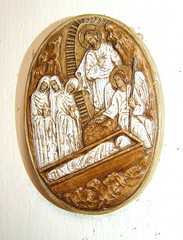 Another old survival is an eroded stone depicting the crucifixion. 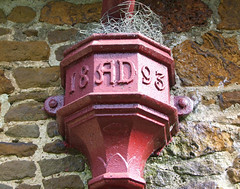 In the 1980s, Mortlock saw this outside, on the west face of the tower. 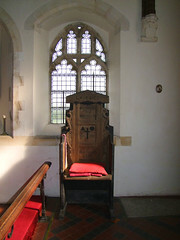 Today, it sits inside the church on the north side of the chancel. This is a lovely place, as remote from its century as it is from its village in the valley below. As with anywhere like this, it doesn't take a great leap of imagination to imagine the blacksmith and the ploughboy filing in behind you and settling themselves on a bench near the back to suffer the parson's sermon. Mind you, I expect Henslowe's sermons were sometimes worth listening to. And his influence was long lasting. The Anglo-catholic tradition he initiated here at Wormegay and neighbouring Tottenhill lasted long, almost into the 21st Century. But now the benefice system and the sharing of ministry by up to a dozen parishes, which has probably saved the Church of England in rural areas, means that it is no longer possible for an eccentric like Henslowe to take on one or two parishes and do extraordinary things with them. In some ways this is a very good thing, of course, but it does feel like we have lost something with its passing. 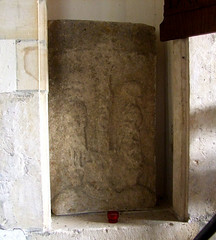 Henslowe was, as was once observed of George Drury of the Akenham burial case, one of the Church's great loose canons. Henslowe's eccentric and enjoyable mark can still be found again and again, 125 years after his death.